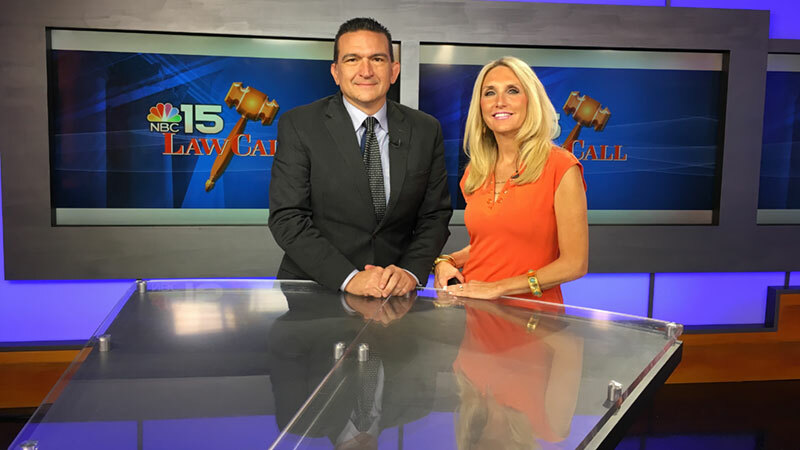 LawCall Midday is a live, local, weekly 4 to 5 minute interview segment on a broadcast network TV station (ABC, CBS, NBC or FOX) featuring your firm’s attorneys as weekly guests. Included are weekly TV promotional spots and web elements which are specifically designed to increase your visibility and encourage potential clients to interact with you. Weekly promotional TV spots promoting the firm and the segment. Can also encourage viewer questions and interaction through email, social media pages, etc. There is no better way to get known than through the combination of TV and an effective online presence. You and your firm’s partners gain visibility, not only through the weekly news segment, but also through on-air promotion and the mixture of high impact web elements. It takes more than a 30 second commercial to truly show you are a good lawyer. A news interview segment let’s people see how you work, what you know and how you communicate. You can be the legal expert to thousands of viewers. It’s an unprecedented marketing tool for the right law firm to generate a one-of-a-kind image and marketing message. Originally developed in 1996 and now in 5 states, LawCall Midday is part of America’s leading TV legal call-in group – LawCall. Highly skilled television and marketing professionals will develop your abilities and guide you through the process.